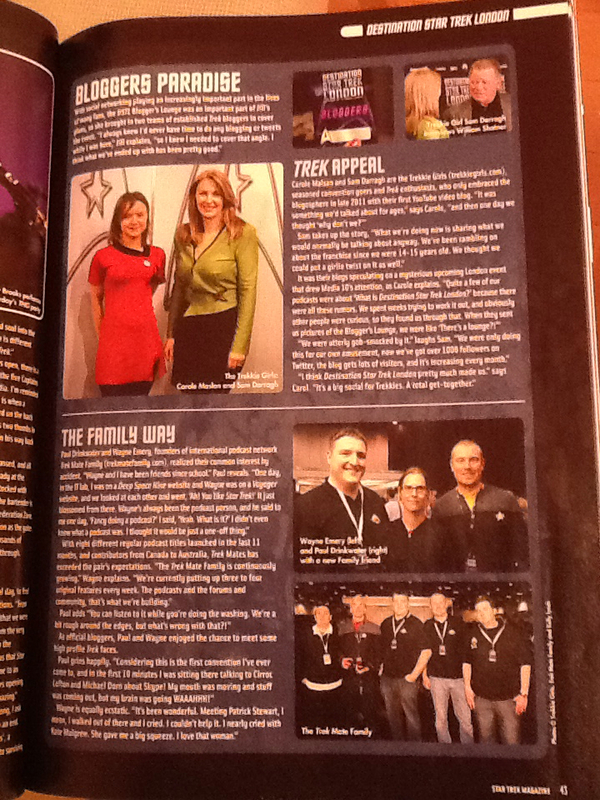 We couldn’t feel more honoured if we we won a bloodwine drinking competition against a Dahar master, but here we are in The Official Star Trek Magazine. Along side our mates from Trek Mate, this edition provides an indepth account of Destination Star Trek London and part of that included speaking to the ‘official bloggers’ – that’s us! The article also provides a good look at the ‘behind the scenes’ of the event. This makes facinating reading whether or not you attended. It was a special privilege to speak to Star Trek Magazine’s editor Christopher Cooper, as we have been reading the magazine since its inception. Whilst our class mates at school were reading copies of Sugar and J-17, we were glued to our Star Trek Mag and preferred interviews with the crew of the Enterprise rather than the latest boy bands. Internet news sites (and those pesky bloggers too) must have made genre magazine production more difficult but even though Trek related information is readily available on web, we still find Star Trek Magazine entertaining, informative and relevant. They get the best and most thorough interviews and we keep on buying. Best feature: A Fistful of Data, where you can ask all those difficult nitpicky questions and get a thorough and reliable reply by Trek expert Larry Nemecek from Trekland. There’s always a ‘behind the scenes’ photo from one of the sets and a story behind it. More Please: We loved the DSTL write up, more convention coverage would be grand. (Yes, our New Years resolution is to talk like Picard). Where to buy: Titan Magazine. Options are to get the magazine delivered or digital download.